I’ll give you another chance. You choose and prepare a Russian tank crew. you show your science, to my cadets. You won’t have ammunition. Just your skill. If you die … you die as a soldier on the battlefield. I thought it was time again to watch a realistic WWII war movie. One that focuses on heroism and the urge to survive. A film where you almost can smell the war and experience the despair, as if you were in the middle of it. Not a movie that shows experimental creatures (like in “Overlord“) or Nazi Zombies. 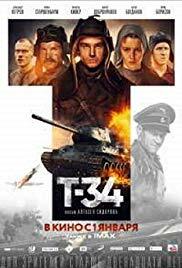 I have to admit that after seeing the trailer for “T-34” (yes, yes, I know I always claim to avoid trailers), I was very curious about this film. The trailer looked phenomenal. And I wanted to see if the entire film was peppered with such spectacular images. Or was the trailer again a summary of the best phases of the film? Believe me. The film is unparalleled from start to finish and keeps you glued to your screen. When it comes to Russian-made films, I need to confess that I don’t know much about that. To be honest, my knowledge is limited to the clichés known about this enormous country. But in hindsight, I really have to admit that I was pleasantly surprised by it. The film didn’t have such an old-fashioned and woolly appearance, but it looked highly qualitative with extremely perfect footage and solid acting. You could say this film has true Hollywood blockbuster allures. Big applause for the T-34. The movie is about the T-34. A Soviet tank that was used en masse against the invasion by Germany in the former Soviet republic. This medium-sized tank, which was provided with thickened armor, was initially unable to cope with the better-made German panzers. However, they had one advantage: the large caterpillar tracks made them tactically very mobile and the infamous mud pools were no problem in the winter period, while the German armored brigades got stuck in it. So the film is a tribute to this legendary tank that helped defeat Nazi Germany. Those slow-motion images were impressive. If you like action-packed war films and want to see how ruthless and cruel a tank battle can be, then you should definitely watch this film (but I am convinced there are other wonderful films that tackle this subject). The confrontations between German tank brigades and Russian lieutenant Nikolay Ivushkin (Alexander Petrov) and his crew are ultra-realistic and impressive. The close-up images in the T-34 with its limited movement space, are breathtaking and have a claustrophobic effect. You can feel the nerves rushing through your own body. Just as the crew, as they realize they can expect a fatal hit any time. You can almost smell the sweat of fear. And it’s the images that leave a huge impression. The slow-motion images of the all-destructive grenades going through steel and concrete, look really exquisite. It all has a very high PC game vibe and perhaps this technique was used a bit too much. But it was entertainment of the highest level. But not only the tank battles impressed me. The part about Nikolay’s captivity in a German concentration camp was also excellent. The scene where the train, crammed with “Prisoners of War”, arrives at the concentration camp in the rain, I found impressive. The despair, despondency, and hopelessness were contained in that one image with the train where dead people fall out of the wagons, the moment the sliding doors open. It’s here that Nikolay is picked out by camp commander Klaus Jäger (Vinzenz Kiefer) to fix a captured T-34 and make it ready for battle with a crew chosen by Nikolay. The intention is that their Russian tank becomes a target during tank practices by the Germans. What Klaus Jäger doesn’t know is that they also found ammunition while removing the dead bodies. And that’s the impetus for Nikolay to escape during such an exercise and after that trying to reach Czech Slovakia. I loved to play “Tank Battle” when I was a kid. When I was young I loved to play the board game “Tank Battle”. “T-34” reminded me of this repeatedly. Only the board game was a bit more peaceful compared to this movie. “T-34” is extremely ruthless and shows how heroism makes the impossible possible. And amidst this war violence, there’s even room for some romance between Nikolay and the Russian translator Anya (Irina Starshenbaum) whose privileges in the concentration camp are invaluable for Nikolay and his companions. I kept asking myself just one thing. What impact did such a grenade (that bounces off the armor) have on the crew in the tank? Is it the air pressure? Or the decibels? Because I can imagine that must be a lot of noise. As if you are sitting in a bronze clock and someone hits it with a heavy sledgehammer. It’s just a futile question about an otherwise excellent and impressive Russian film.